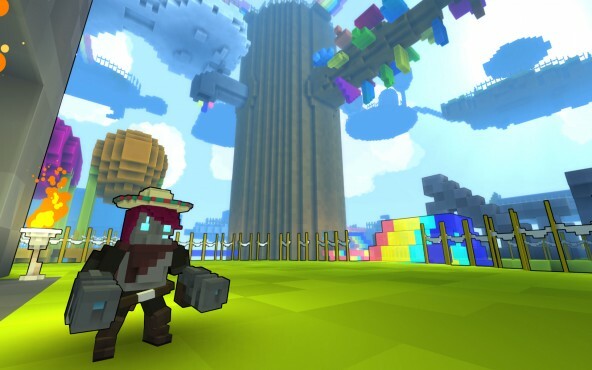 Trion Worlds has announced that Trove, the free to play voxel sandbox, has reached the 1 Million users milestone in less than a month. This news comes as the servers are being updated with the new Manta Ray mounts and new Chaos Chest loot. Trove features 9 playable classes (including Boomeranger, Pirate Captain and Candy Barbarian); challenging procedurally generated dungeons, landscapes, and lairs; a limitless supply of loot and a deep crafting system. Creators can quickly save designs for instant building and use the game’s Cornerstones mechanic to preserve their creations. Congratulations to Trove on achieving this milestone so quickly! How many of those accounts are bots? I like the game and played it on stream for about a week then it got a bit old playing fallout shelter not check me out on twitch my twitch name is swiffty86. More children indoctrinated into cash shops and gambling boxes. If childeren are going to be indoctrinated with their cash shop system that’d be super awesome! Every single Cash Shop item can be bought with ingame currency as well from other players, since it is all tradable… I call that a win for everyone. Personally as a max level player I can earn 10~€ of value every single day, by just playing. Not even mentioning that everything actually buyable is a cosmetic! Too bad the game gets boring and repetitive pretty fast. Real content > numerous community created items. Wished it feels like a million players. It feels like a hundred players, especially when I’m doing dungeons alone or entering the hub. If only they could expand that, allow more players to see each other and make the world more MMORPG like, since every dungeon can be easily soloed at the right level. The only thing that would ever require teamwork would be like shadow arenas. So far it feels like I’ve been playing this game solo. I agree theres not alot of party friendly content. As it is the main game I am currently playing I like to keep up on whats to come and from what I gathered shadow tower is supposed to fill that role in the next big update. Also as you progress a little more 3 star dungeons become a little difficult so im sure people would party for those.